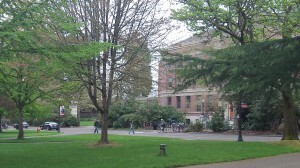 At Oregon State University, last April. The real reason college costs so much, according to an author interviewed in the Wall Street Journal on Aug. 24, is federal aid including student loans encouraged and subsidized by Congress. This gusher of federal money — more than $100 billion a year now, according to the story — drives up what colleges can charge and what they can pay their employees, especially their administrators. At Oregon State University, for instance, the state transparency website shows that as of June 2012, the payroll included 499 people with an annual salary of $100,000 or more. No wonder housing prices in Corvallis are as high as they are. Unlike other state colleges listing their payrolls on the state site, OSU gives only the barest job titles for each of its nearly 5,000 employees. But here’s a sampling: The university president ranked fourth on the list, at $425,700. Ahead of him was a head coach, presumably football, at $860,004; a director (it doesn’t say of what) at $440,364; and an assistant coach at about $440,000. An assortment of other coaches, assistant coaches, provosts, vice presidents, vice provosts and deans rounded out the top 30, all of them making more than $200,000 a year. From David Moore, via Facebook: I was talking with some OSU professors the other day. I’m an alumnus there. They are terrified that the University system is in great peril. People no longer have to go to college for special knowledge; as it is already on the Internet. Rood riddance, I say. Let it die. From Hazel Siebrecht: Something else I don’t understand is “prevailing wage.” I have a grandson who works for a company that installs shelving. When he works for the state of Oregon or the Feds, his prevailing wage is close to $44.00 an hour. His regular wage is a bit less than $20 per hour. This makes no sense.